backpacker indonesia : Goa Cerme at first is a meeting place used by Walisongo to disseminate and teach the religion of Islam in Java. The word 'Cerme' is derived from the word 'lecture', the discussion held during the meeting to discuss plans to establish in the Great Mosque in Demak, a city in north central Java. Located in the village of Imogiri Selopamioro 20 km south of Yogyakarta. The length of cave entirely approximately 1.5 km and ended at a spring in the Grill, precisely in the village Ploso, Giritirto, Gunungkidul District. The average depth of the water flow of about 1 to 1.5 meters. In addition to the main cave there is another smaller cave where the past is used for meditation place like goa puppeteer. Ledhek Goa, goa Badhut, and The Cavern. On Monday or Tuesday Wage pengunjng many have come to ask God's blessings with thanksgiving ceremony. During the holidays, many students and young people to visit this temapat. Along the hallway there is a stage Cerme cave once used for a meeting place. To reach the front gate of the cave, one must climb 759 meters of stairs. Better if visitors contact the Interpreter Lock or guardians first cave to get the information or correct information. This includes goa Goa a long and deep. Way to achieve this excellent location and distance, about 20 km. Landscape headed to Goa Cerme from the last village is very good. In the daytime, if the weather sunny, the city of Yogyakarta to look beautiful and at night could see the sparkling city lights. 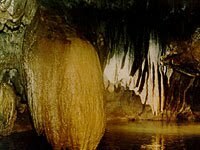 The main attraction of this cerme Goa is beautiful stalactite and stalagmite and the existence of an underground river and a lot of bats hanging in the cave. Conditions inside the cave without lights and floor lighting dark cave flooded by ground water, which in the rainy season, water will be put (up), but in the dry season the water subsided. In general, foreign tourists visiting the cave Cerme spend between three to five hours at the location.